At Merchants Bonding Company, we know that our associates are involved and giving back in ways that we aren’t aware. So each year we recognize two people, nominated by their peers, for their extraordinary involvement in their communities. The recipient of the Shining Star Award is given the opportunity to select the registered charity of their choice (eligible organizations have 501(c)(3) status as determined by the IRS) to which the Merchants Bonding Foundation will make a donation of $2,000. The runner up will be given a similar opportunity to select the registered charity of their choice (eligible 501(c)(3) organizations) to which the Merchants Bonding Foundation will make a donation of $500. The associates who nominated the winner will also be given the opportunity to select the registered charity of their choice (eligible 501(c)(3) organizations) to which the Merchants Bonding Foundation will make a donation of $100. 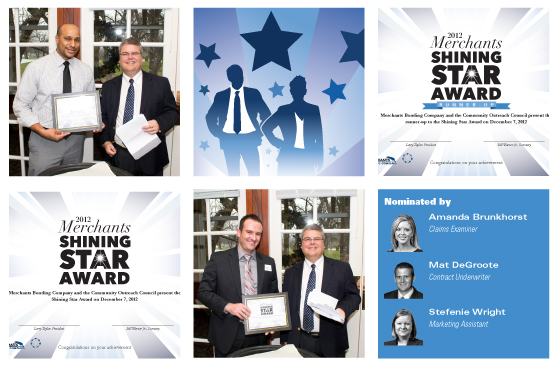 This year the winner of the Shining Star Award was Contract Underwriter Keith Harris. Keith will be donating the $2000 to Hawthorn Hill, an organization that helps the homeless obtain permanent housing, and provides services to help homeless families achieve economic self-sufficiency. Keith was nominated by Claims Examiner Amanda Brunkhorst and Contract Underwriter Mat DeGroote. Amanda will be donating to Hope Ministries and Mat will be donating to St. Boniface. The runner-up was Contract Underwriter Chris Seiberling. Chris received $500 and will be donating his gift to the Blank Park Zoo. Chris was nominated by Marketing Assistant Stefenie Wright.